A fine review from Cory Doctorow at Boing Boing! “Book shows sweet, alien love stories unfolding in our backyards. “In Frost and Lieder’s third exploration of tiny creatures taken for granted in the natural world, they top themselves, lyrically centering on a firefly’s search for a mate. 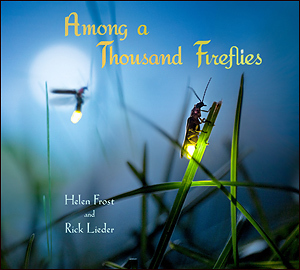 “Frost and Lieder collaborate on a third picture book, featuring a poem by Frost illustrated with Lieder’s luminous photographs. “I discovered your photography thru the library where I work. We just got in “AMONG A THOUSAND FIREFLIES”, which is absolutely magical. I have always loved fireflies so much. FIREFLIES is on ALA’s Notable Children’s Books Discussion List! “This simple, delightful story of two fireflies finding each other among thousands is sure to enchant children. “If this is a picture book for young children, then we are all young children. Yes, it’s short–it can be read in a few minutes–and yes, the story is simple–about how a firefly finds her mate through his pattern of flashes. And yes, it’s a picture book. But what pictures! They are all beautiful night scenes with darkness and moonlight and fireflies on grasses and flowers and in flight. Two of the photographs show flower petals shining with amazing brightness from the light of the fireflies on them. “It’s always nice to peek into the world of other creatures. We truly don’t know how hard it is sometimes being so small in a big world and we often forget that it can be wondrous.